A good stage hypnosis show can brighten your day, give your worries a much-needed vacation, and leave you absolutely glowing! Some people think stage hypnosis undermines and makes a mockery of hypnotherapy. I don’t agree. While hypnotherapy helps to address and solve real problems, stage hypnosis uses the same powerful abilities of the mind to enable people to have fun, become less inhibited and engage in the healing power of laughter. It took me quite a while to decide to perform stage hypnosis. I have to say that after all I’ve learned, I admire those brave enough to perform on stage. To be a good stage hypnotist it takes skill, talent, flexibility, showmanship, as well as the ability to manage a crowd – all at the same time. And that’s no easy task since people can be unpredictable. My (over 34 year) career in social work, coaching, hypnotherapy and fitness training allows me to help people serious about making meaningful, powerful and permanent changes in their lives. I absolutely love this work and I am blessed and honored to be able to support people in this way. So what is involved in stage hypnosis? Well, if you are one of over 3000 people I’ve hypnotized to date, you have enjoyed that wonderful feeling of hypnosis. If however, you’ve never attended one of my classes or been a client, you need to know that hypnosis feels fantastic! It is a very safe, normal, and natural state that we are in and out of all day long. It’s very similar to daydreaming, or that place we are in just before we wake up or just before we doze off. Stage hypnosis is performed in front of an audience for the purposes of entertainment. It involves inviting volunteers on stage to be hypnotized and given suggestions to engage in comedy routines that leave audiences begging for more. Not only does it feel great, hypnosis is actually very good for the mind and body. It is similar to meditation and brings with it all the healing properties of meditation such as stress relief, and inner peace and focus. There is nowhere else in our lives that we relax this deeply and in such a healing way. In fact a half hour of hypnosis is equal to two hours of solid sleep. When we are in the state of hypnosis we are open to suggestions. It’s important to know that you must agree to be hypnotized. You can’t be made to violate your morals are your ethics or tell your deepest darkest secrets. Nor can you ever be stuck in hypnosis. So if you’ve never been to a stage hypnosis show, why not improve your health and overall well being by either attending or booking a show in the next few months. Let me know if I can help in any way. Patricia Eslava Vessey, personal development guru, has helped thousands of people to dream bigger, make better choices, and achieve powerful and lasting changes for well over 34 years. She has hypnotized thousands of people and led hundreds of group hypnosis classes, and private one to one sessions for all ages. Patricia has helped thousands stop smoking, lose weight, eliminate phobias, fears, anxiety and stress. She’s helped people run successful businesses, play better sports, perform better and have more confidence and much more. 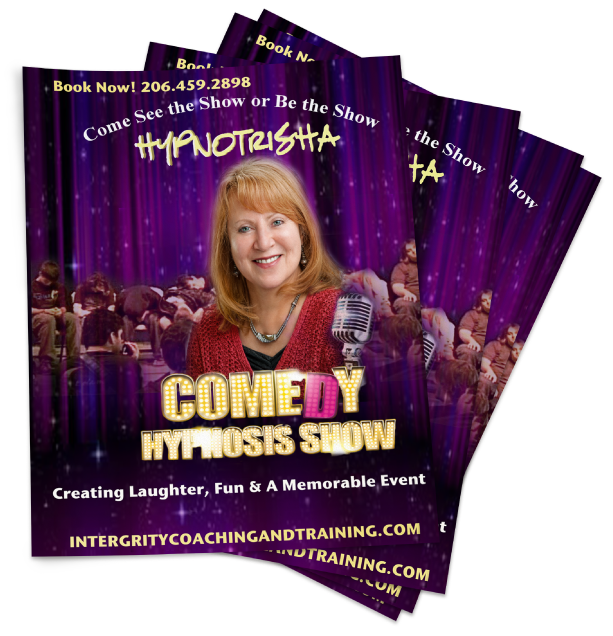 As a stage hypnotist, she focuses on the fun side of hypnosis, surprising everyone at how truly amazing our minds really are….Hypnotrisha’s combination of music, audience participation, and comedy create an unforgettable show. Her unique, interactive show will have your audience on the edge of their seats and dancing in the aisles. Recently seen on stage at the NW Women’s Show, The Quinault Resort & Spa and The Golden Paws Gala, Patricia’s shows highlight, celebrate and appreciate the volunteers, the TRUE STARS of the show so they can look their very best. Her goal is to infuse her shows with laughter, lightness, and so much fun everyone will talk about and remember them for a long time to come! She is available for corporate functions, graduation events, fundraisers, and other events. Patricia is also a motivational speaker trainer, leadership and teambuilding coach and health and fitness trainer. She has created and delivered numerous specialized seminars and corporate events and is available to support your team. Motivational Shows are designed to help your team improve performance, set and accomplish goals and celebrate your success. Through employee team building techniques, Patricia demonstrates how to break free of self-limiting beliefs and live life to the fullest by achieving more than you ever thought possible. Hypnotrisha is available for Corporate Events, Office Parties, Conferences, Holiday Celebrations and more! If you are looking for a way to raise funds for your organization, look no further. We love supporting non-profits and others to raise money to get the help they need. The answer to your needs is Stage Hypnotist, and professional personal development guru, Patricia Eslava Vessey. Comedy Hypnosis Shows are a great way to build interest and draw a crowd of people for your next fundraiser, and it allows people of all ages to join in the fun, laugh and truly enjoy the experience. How Soon Should I Book A Show? It is a good idea to book as soon as possible, especially near or around major holidays and weekends. Simply send us an email or call us (206) 459-2898 pevessey@gmail.com to get the process started right away. Things You Should Do After Booking Comedy Stage Hypnotrisha! Let everyone know that a hypnotist will be at your event. Comedy stage hypnosis relies on people who are enthusiastic, ready and willing to experience the wonderful state of hypnosis. You can help by building excitement. Once your show is booked, tell everyone you know on social media sites, friends and family functions and networking events. Do as much as you can to build excitement and raise curiosity about the show. Send out flyers posters and make personal invitations so that on the night of the show you can just sit back… relax, and get ready for a hysterical evening of fun and laughter.